Tell me. Why do the plane foods have to be so mediocre? Er, yes, like the majority of air travellers?! It is my belief that special chefs and wine experts advertised by airlines should create menus all across the board, not just for the special rich classes. Yes, airplane foods are hard to get right - they should be tasty, well presented, nutritious, easy to digest, transportable, and easy to prepare and store. Sometimes the option you wanted will run out before the food trolley gets to you. But that's not the main problem. Most of the time, I hardly touch my main, and settle down for the entree or the biscuits. Special meal requests like vegetarian or gluten free don't come with options, and you are served way ahead of everyone else, so you eat alone like you are being punished for being difficult. Also, why do they always have eggs in the breakfast meals? Whichever way they cook it - scrambled, omelette, poached, or else - the eggs never come out looking right. 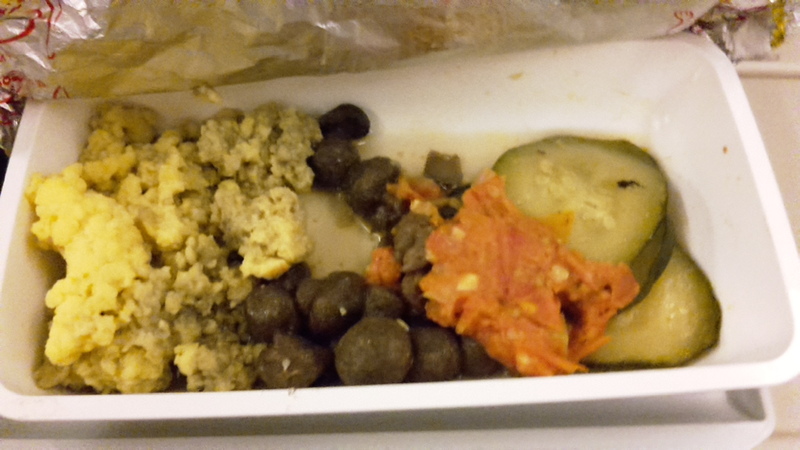 By the way, the meal above is scrambled eggs, mushrooms, mashed carrot - tasteless - and pickled cucumbers - salty. Hmm.. No, thanks. Airlines do conduct researches on what their customers want the most out of their services. Food quality apparently isn't that highly ranked. As someone who would gladly pay extra to get meal upgrades on cheaper, and especially long haul, flights, I don't understand. What are your favourite airplane meals? What would you like to be served on your next flight?